Jordan has been accused by former wrestlers he coached years ago at Ohio State University of turning a blind eye to allegations of sexual abuse. Ohio Republican Rep. Jim Jordan, a conservative firebrand and staunch ally of President Donald Trump, said Thursday he would run to succeed Paul Ryan as House Speaker. "Should the American people entrust us with the majority again in the 116th Congress, I plan to run for Speaker of the House to bring real change to the House of Representatives," Jordan, a founding member of the House Freedom Caucus, said in a statement. "President Trump has taken bold action on behalf of the American people. Congress has not held up its end of the deal, but we can change that. It's time to do what we said," added Jordan, who also sent a letter to his House colleagues announcing his intention to run. 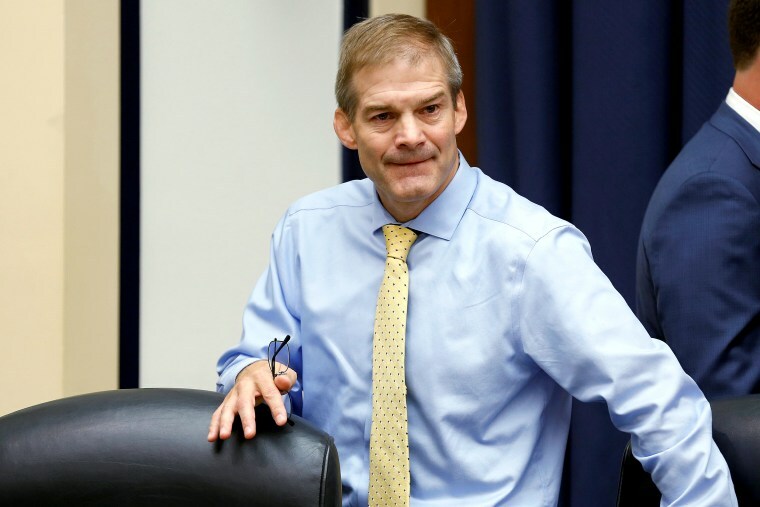 Jordan, a six-term congressman who represents north-central Ohio, aligns with the most conservative wing of the GOP and has been a fierce critic of special counsel Robert Mueller's investigation into Russian interference in the 2016 election, even helping to introduce articles of impeachment against Deputy Attorney General Rod Rosenstein, who is overseeing Mueller's probe. Jordan, however, has faced questions in recent weeks after NBC News reported on accusations by several former wrestlers he coached more than two decades ago at Ohio State University that he failed to stop the team doctor from molesting them and other students. The university announced in April that it was investigating accusations that Dr. Richard Strauss, who died in 2005, abused team members when he was the team doctor from the mid-1970s to late 1990s. Jordan, who was assistant wrestling coach at the university from 1986 to 1994, has repeatedly said he knew nothing of the abuse until former students began speaking out this spring. Jordan said Thursday he didn’t expect the accusations to derail his run. "Everyone can see through that story," he said. "I've talked to numerous of my colleagues, and they can all see through that story." Current House Speaker Paul Ryan, R-Wis., said in April that he wouldn’t seek re-election in November, joining dozens of other Republicans who have announced their plans to retire ahead of the 2018 midterms and setting the stage for an intraparty struggle over who will lead the often-divided conference. Jordan is likely to face House Majority Leader Kevin McCarthy, R-Calif., who is widely expected to launch a bid for the post, as well. Ryan endorsed him as his successor in April before the race even officially got underway. McCarthy, who hasn't yet said he intends to run, told NBC News that he is "spending the time keeping the majority" when asked about Jordan's announcement. Freedom Caucus Chairman Mark Meadows, R-N.C., for his part, told reporters he supported Jordan's bid.